A couple years ago, I read “The Time Traveler’s Wife,” and enjoyed it. It was a mind-bending premise, but the author managed to write so convincingly that I suspended disbelief and found myself rooting for the couple to defy time and find their slice of happiness. 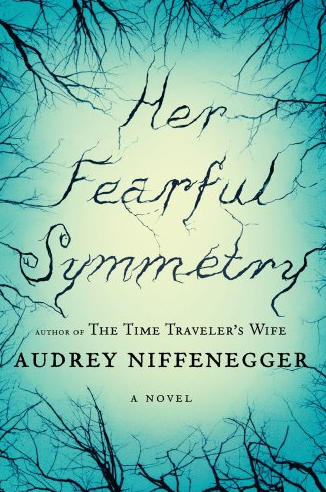 In “Her Fearful Symmetry,” Neffenegger again tackles the theme of star-crossed lovers playing in another dimension – this time blurring the line between life and the after-life. I loved the premise of this book: two middle-aged identical twins are estranged and haven’t spoken for years. One lives in London, childless; the other lives in Chicago with a set of identical twin daughters who look strikingly like their mom (and aunt) had at the age of 20. When the London sister dies, she leaves her apartment to her nieces – whom she has never met – on the condition that they live in it a for a year before they sell it and that their parents cannot set foot in it. Add to this a cast of auxiliary characters that include an agoraphobic neighbor and the deceased aunt’s much-younger boyfriend, and it’s off to a rollicking start. ← Waxing poetic. Or just waxing.